After a teaser showing at this year's CES 2019, HTC has just dropped a ton of new information on its website about its next consumer-facing VR headset, the Vive Cosmos. 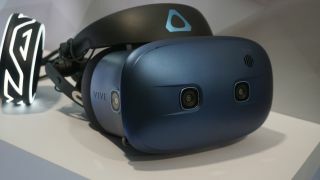 As announced earlier, the Cosmos will indeed be the next evolution for the Vive series of headsets, offering next-level gaming in virtual reality. Unlike the original Vive and Vive Pro, the Cosmos will use a new version of HTC's tracking system that will allow you to bring the headset with you from one place to the next. The last feature HTC is touting is the new flip-up design that will allow you to raise the headset when you want to jump in the game, and quickly flip it up when you need to see what's happening in the real world. The new design should make it easier to wear for hours... but we'll need to wear it for ourselves to verify that claim. All that said, HTC is still being reclusive about the release date and potential price for the next-gen headset. For HTC right now, it's all about building hype. What we do know for sure is that the headset has side-facing cameras and second-gen controllers that look nearly identical to the ones Oculus made for the Rift. HTC says that the Vive Cosmos won't need any sensors for it to work, which likely means that the cameras located on the fronts and sides will be responsible for tracking.